President Trump’s nominee to head the General Services Administration encountered a relative lovefest during her Senate confirmation hearing on Wednesday, with senators of both parties applauding her 20-year background in federal procurement that includes time at GSA itself. 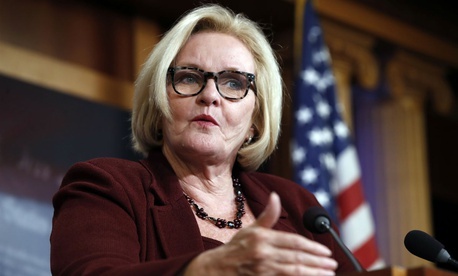 “I can’t imagine someone more qualified for this position,” said Sen. Claire McCaskill, D-Mo., ranking member of the Senate Homeland Security and Governmental Affairs Committee, of nominee Emily Murphy. The senator added that she is personal friends with the nominee’s family in St. Louis and praised Murphy and two other nominees present for their willingness to take on public service at a time when it is not popular. McCaskill and Chairman Ron Johnson, R-Wis., also highlighted Murphy’s embrace of new congressional tools and Government Accountability Office recommendations to try to accelerate the GSA-run governmentwide efforts to dispose of excess federal real estate. McCaskill underlined the importance of listening to whistleblowers reporting waste, fraud and abuse. Her four main themes, she said, would be ethical leadership, reducing duplication through such tools as shared services, looking for ways to increase competition at the contract and task order level, and improving transparency, particularly in GSA databases. She also promised to work closely with the inspector general. Murphy also said the Homeland Security Department’s consolidation of headquarters at the St. Elizabeths hospital grounds was proceeding, with a new plan in the works in cooperation with DHS. She told Sen. Jon Tester, D-Mont., that her agency could do a better job of speeding up the opening of Veterans Affairs Department medical centers in rural areas. And in December, she said she expects GSA to have new information from other agencies (among them the Office of Personnel Management) on their use of buildings to improve the transparency of the excess property databases. McCaskill did extract a promise from Murphy as well as co-witnesses at the hearing to move away from the Trump administration’s early tendency to give agencies permission to ignore document requests from all lawmakers but the majority’s committee chairmen. She agreed to respond to requests from all members, as did Jeff T.H. Pon, nominee to be director of OPM, and Michael Rigas, Trump’s pick to be OPM deputy director.